That's the South Pole in the crosshairs on the map of Antarctica. The word 'McMurdo' is to its left. 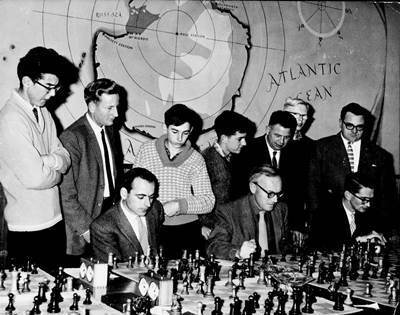 A chess tournament between Christchurch [New Zealand] players and Americans at McMurdo Sound, Antarctica, had to be adjourned with 10 games only half-way through when radio conditions deteriorated yesterday afternoon. The play was tapped out on teleprinters in the communications room at the American base at Harewood and on teleprinters at McMurdo Station. But as the sun sank lower the radio frequency had to be changed, and difficulties at the Antarctic end began to slow up the games. The Americans suggested an adjournment to Sunday, June 14. "It's a bit hard to tell," said Mr. A. S. Hollander, president of the Canterbury Chess Club, "but it looks as if we are leading." Chess is one of the very few ways in which the winter population of McMurdo Sound can participate in the life of the outside world, and Mr. Hollander thinks the Americans would like to play a lot more chess in future. "I'm sure there'll be a return match at least," he said. My guess is that the photo was taken on the New Zealand side of the radio match. Why are there two boards in front of each player?